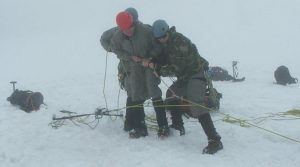 One of most complex learning designs we ever put together was the Crevasse Rescue scenario for the HSVO Project, funded by CANARIE. 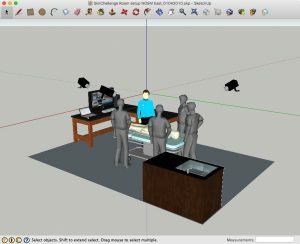 The scenario showed how we were able to blend a complicated set of tools, resources and platforms across 5 centres, 5 time zones, 5 simulation platforms and 4 sets of learners. We used some very sophisticated, network enabled platforms, along with a bespoke integration suite called SAVOIR. The story starts in the far north, where a glacial researcher (yes, he was too slow!) fell into a crevasse and had to be carefully extricated. He is then transferred to the remote research base, his injuries are assessed, and then he has to be flown out to a tertiary care trauma centre. 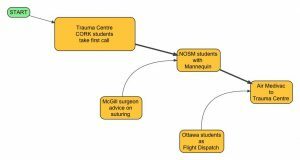 The various teams involved, across the five centres (NOSM, McGill, Ottawa, NRC and Cork) had to work together, and find a tricky balance between care and speed. To cap it all, a major storm was moving in so they could not take too long at each stage and must balance the risks for all concerned. This project made excellent use of the high-speed networks and HPC clusters afforded by CANARIE. 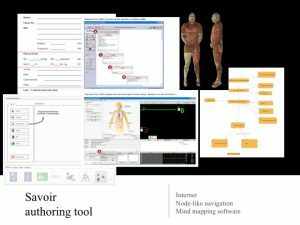 …we still found that the learning designs afforded by OpenLabyrinth were highly necessary as ‘conceptual glue’ to hold the scenarios together. Ellaway, R., Topps, D., MacDonald, J., Copeland, B., Olmos, A., & Spencer, B. (2010). 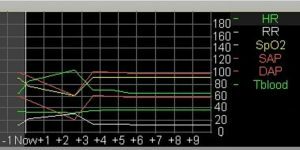 HSVO: A functional XML specification for integrating simulation devices. Bio-Algorithms and Med-Systems, 6(11), 47–51.